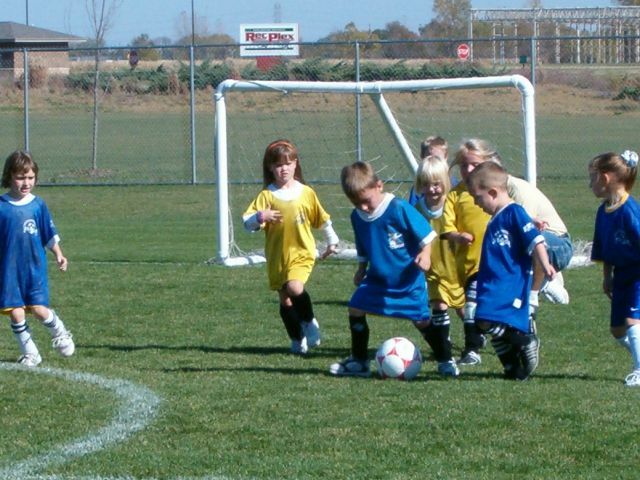 I was the coach of my first-born daughter’s soccer team when she was 5 years old. The coaching requirements, apparently, were lack of competing hobbies and near infinite patience. As it turns out lack of knowledge of the game and no discernible experience in coaching did not seem to matter. If you’ve never seen a bunch of 5 year olds play soccer, it goes down pretty much like this. One of the kids kicks the ball and the rest start chasing it madly (except for that one girl who decides to stay back and get a jumpstart on her botany career). Once the scrum catches up to the ball, they all flail their legs a bit until, through luck or the kind of perseverance that will serve them well later in life, one of them makes contact and the ball squirts free. The cluster once again goes running after it with reckless abandon. This goes on for about an hour. Now when I had some spare time from selling stuff nobody needs (I worked for a retailer) and my fellow coach wasn’t out saving lives or something far more noble (he’s a doctor), we both tried to learn a bit more about the game and how to coach it. So during practices and games we tried to impart some of our new-found wisdom. I guess there was just something so new and exciting about the game and that ball that those kids just couldn’t resist chasing. It was going to be some time before they learned the discipline to pace themselves. It would take practice to appreciate that they were all in it together–and that by all of them trying to be the hero, the team was in fact being held back. They would need more experience to learn that just because everyone else was running toward something didn’t mean it was right for them. Eventually, they would come to see that impulse and enthusiasm is great, but so is awareness and discernment. And hopefully they’d learn to pick up on the subtleties of metaphor.